Six In Line Magnetic Separators (PIMS) are due to be installed in a UK plastic production facility. 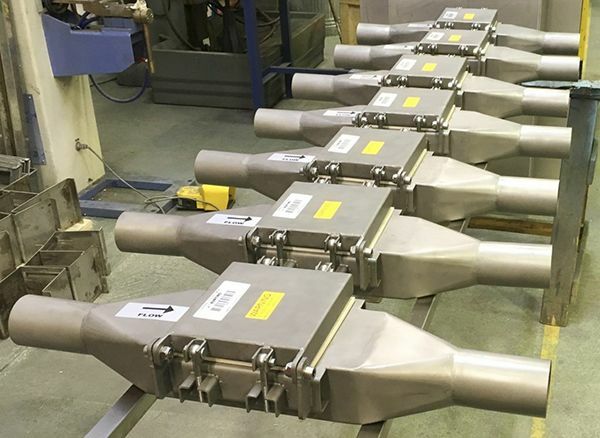 Manufacture of the magnetic separators took place at Bunting’s Berkhamsted facility. The project originated from a discussion at the Interplas exhibition in 2017. The In Line Magnetic Separator offers great versatility with ease of installation and maintenance. Inside the tube-like body is a strong Plate Magnet. This ensures that there is no restriction to the flow of material without compromising on the separation of metal contamination. At this plastics product manufacturing plant, the customer needed to protect six injection moulding machines from potential damage. The magnetic separators would be removing magnetically susceptible materials from the 3mm plastic pellet feed. Commonly, FF Drawer Filter Magnets are used in such installations, but there was an issue with height above the injection moulding machines. During an onsite plant review, the ideal location was identified. The six vertical feed pipes, earlier in the process, provided good access for installation and regular cleaning. Each In Line Magnet has a high strength Neodymium Rare Earth Plate Magnet. This projects a strong magnetic field into the flow of plastic pellets, attracting rogue ferrous metal contamination. The metal is held on the surface of the Plate Magnet. Periodically, on a frequency defined by the level of metal contamination, the Plate Magnet is hinged out of the product feed and cleaned. For further information about metal separation equipment designed for removing metal during the plastic or plastic product manufacturing process, please contact Bunting Magnetics Europe below.